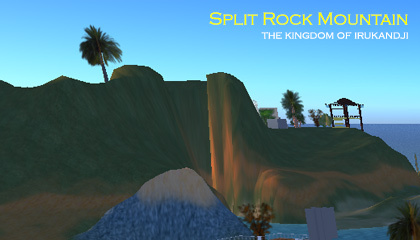 The simulator, Split Rock Mountain is a region in the Palace District in northwest Irukandji. Split Rock Mountain came about in the wake of our 'conquest' of the French territories in the west, later named Kalamat State. 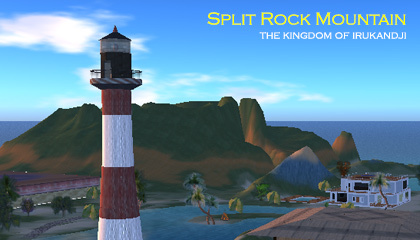 Split Rock Mountain featured a cleaved mountain with a submarine base hidden within. A submarine channel also ran under the island, which traversed three sims. Its outflows were at Aquitaine Bay in the west, and Boyfriend Beach in the east. A large residential block occupied the north facing slope of Split Rock Mountain with a private beach frontage in Byron Bay. The parcel was purchased within hours of being offered for sale and remained occupied until the sim was eventually decommissioned in January 2009. Regions adjoining Split Rock Mountain, clockwise from south, were Crystal Atolls, Baie de Triomphe, Aquitaine Bay, Coraki Lagoons, Byron Bay, Palace Lagoon, Boyfriend Beach, and Baie de Citron. 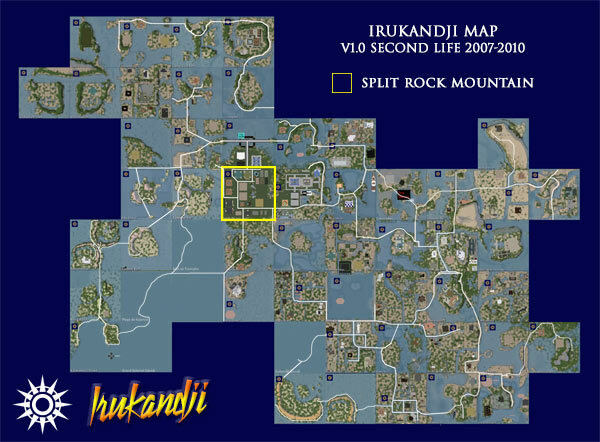 Below are some photographs of Split Rock Mountain that I took during my travels around the Irukandji islands.